MINSK, Sept. 22 (Xinhua) -- Zhao Leji, a senior official of the Communist Party of China (CPC) on Saturday concluded his official good-will visit to Belarus, where he and Belarusian officials agreed to step up cooperation between the two countries. 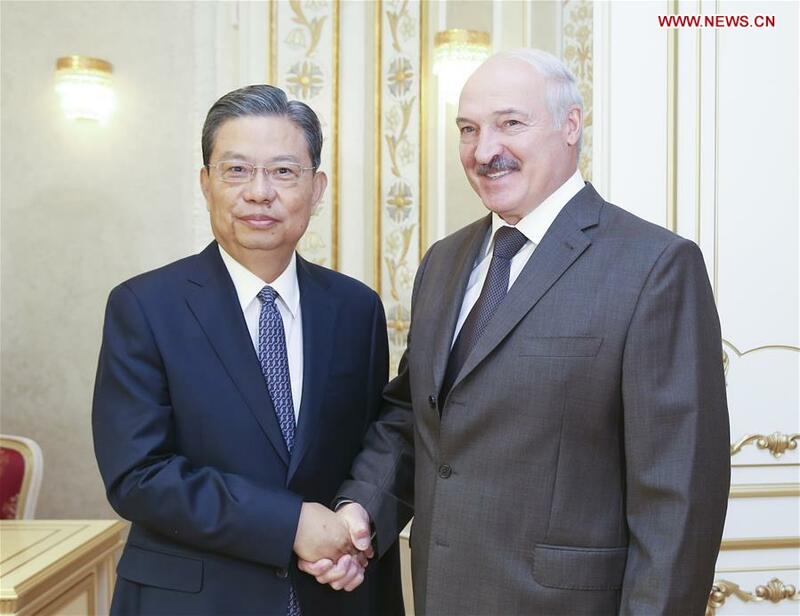 During the meeting with Belarusian President Alexander Lukashenko, Zhao, a member of the Standing Committee of the Political Bureau of the CPC Central Committee, conveyed the greetings of Chinese President Xi Jinping to Lukashenko. Zhao, also secretary of the CPC Central Commission for Discipline Inspection, praised Lukashenko's contribution to the development of China-Belarus relations. He recalled that Xi and Lukashenko charted course for the future development of bilateral ties at their meeting on the sidelines of the Shanghai Cooperation Organization's summit in China's Qingdao City in June. Zhao said his visit was aimed at implementing the important consensus reached by the two presidents, improving strategic communication, promoting mutually beneficial cooperation and enhancing friendship between the two peoples. China and Belarus has, as always, firmly supported each other in following their respective development paths in line with national conditions, he said, expecting new efforts from both sides to create a new type of international relations and a community with shared future for mankind. China and Belarus are of the same mind that the core of the leadership of the ruling party and the country should be safeguarded, said Zhao, who also briefed Lukashenko on the situation about CPC's tight governance over the party. Lukashenko asked Zhao to convey his greetings to Xi, saying Belarus and China are good partners and friends as solid as iron. Belarus is grateful for China's support and ready to strengthen cooperation with China in economy and trade, finance, agriculture and people-to-people exchanges, he said. Lukashenko spoke highly of China's development and the achievements in CPC's party building and said his country is willing to draw on China's experience. In talks with Prime Minister Sergei Rumas, Zhao said China is ready to align the Belt and Road Initiative with Belarus' national development strategy and enhance cooperation in economy and trade, finance and people-to-people exchanges. Rumas said Belarus is committed to mutually beneficial cooperation with China under the Belt and Road Initiative, including the China-Belarus industrial park Great Stone. When meeting Mikhail Myasnikovich, Chairman of the Council of the Republic of the Belarusian National Assembly, Zhao said China attaches great significance to exchanges between the two legislatures and he expected the cooperation to continue. Myasnikovich agreed to increase exchanges between the two legislatures so that Belarus-China relations would develop on a solid legal basis. During talks with head of the presidential administration Natalia Kochanova, Zhao said he hopes the Belarusian presidential administration and the organs of the CPC Central Committee will work closely together to implement the consensus reached by Xi and Lukashenko in Qingdao. Kochanova vowed to further exchanges and cooperation with the organs of the CPC Central Committee. She and Zhao also witnessed the signing of a memorandum of understanding on supervisory bodies cooperation.